For a long long time, there has been a myth in the minds of the Indian people that jewellery is just associated with marriages, functions and festivals. 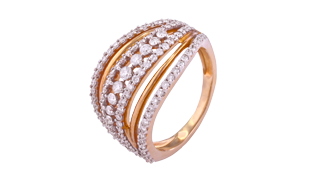 People only tend to go out and buy jewellery and spend a lot of money purchasing eye-catching designs that suit their status, only when the occasion arises. Once purchased and worn for a few times, they generally tend to keep it locked away in safes for the rest of the year and take it out just once in a while. Well, not anymore. In order to change this thinking and revolutionize the purchasing of jewellery for the future generations, TDF introduced it’s Rozaana collection which has been a tremendous game changer in the market and the clients are just loving it. A collection of jewellery that can be worn on a daily basis and the best part about it is, a variety of designs to choose from made available to the customer at pocket friendly prices too. Why wear jewellery that makes you look more beautiful, just one day of the year, when it can add more beauty and complete your look each and every single day instead. Whether you wish to flaunt it at work, a cocktail party or want to go hang out with your friends and show-off your precious dimaonds, TDF offers you plenty of magnificent designs to choose from. Come visit any one of stores at either Bandra, Andheri, Vashi or now even at Falnir Road, Mangalore and be a part of the TDF family.